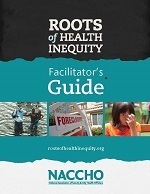 The Roots of Health Inequity is an online learning collaborative designed for the public health workforce. Based on a social justice framework, the course introduces public health practitioners to concepts and strategies for taking action in everyday practice. For groups that wish to enhance the online course with in-person discussion sessions, this Facilitator’s Guide, updated in September 2016, provides in-depth guidance on facilitating social justice conversations, as well as detailed discussion and activity suggestions.